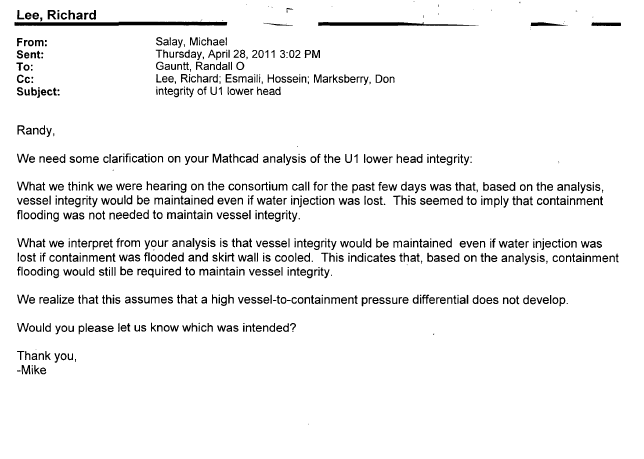 What we think we were hearing on the consortium call for the past few days was that, based on the analysis, vessel integrity would be maintained even if water injection was lost. This seemed to imply that containment flooding was not needed to maintain vessel integrity. What we interpret from your analysis is that vessel integrity would be maintained even if water injection was lost if containment was flooded and skirt wall is cooled. This indicates that, based on the analysis, containment flooding would still be required to maintain vessel integrity. We realize that this assumes that a high vessel-to-containment pressure differential does not develop. Would you please let us know which was intended? 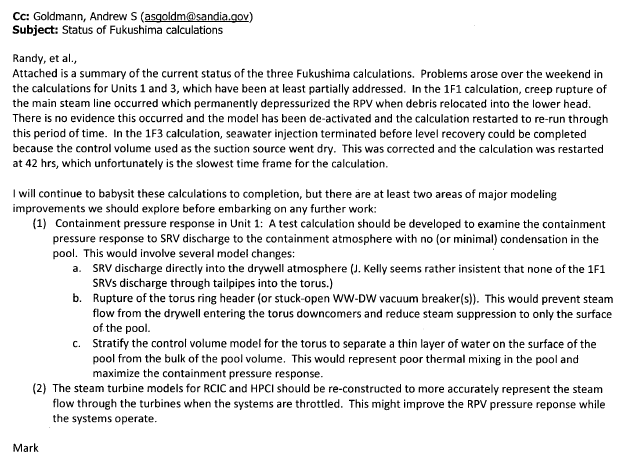 Attached is a summary of the current status of the three Fukushima calculations. Problems arose over the weekend in the calculations for Units 1 and 3, which have been at least partially addressed. In the 1F1 calculation, creep rupture of the main steam line occurred which permanently depressurized the RPV when debris relocated into the lower head. There is no evidence this occurred and the model has been de-activated and the calculation restarted to re-run through this period of time. In the 1F3 calculation, seawater injection terminated before level recovery could be completed because the control volume used as the suction source went dry. This was corrected and the calculation was restarted at 42 hrs, which unfortunately is the slowest time frame for the calculation. b. Rupture of the torus ring header (or stuck-open WW-DW vacuum breaker(s)). This would prevent steam flow from the drywell entering the torus downcomers and reduce steam suppression to only the surface of the pool. c. Stratify the control volume model for the torus to separate a thin layer of water on the surface of the pool from the bulk of the pool volume. This would represent poor thermal mixing in the pool and maximize the containment pressure response. (2) The steam turbine models for RCIC and HPCI should be re-constructed to more accurately represent the steam flow through the turbines when the systems are throttled. This might improve the RPV pressure reponse while the systems operate. PLEASE DISCARD the earlier summary of the MELCOR calcs. The 1F1 calculation was so corrupted by the inadvertent MSL creep rupture that it should be ignored. ATTACHED is an updated summary of results, which corrects the 1F1 response to the debris relocation into the lower head. The creep rupture model was deactivated and the subsequent damage progression has been corrected. Sorry for distributed the earlier flawed results. Attached are the latest results I’ve received. The short email chain might also be useful. I spoke to Randy. The conclusion is not the same that I heard from RST this past two days. Randy is on his way to work. Perhaps, we can chat with him later today. 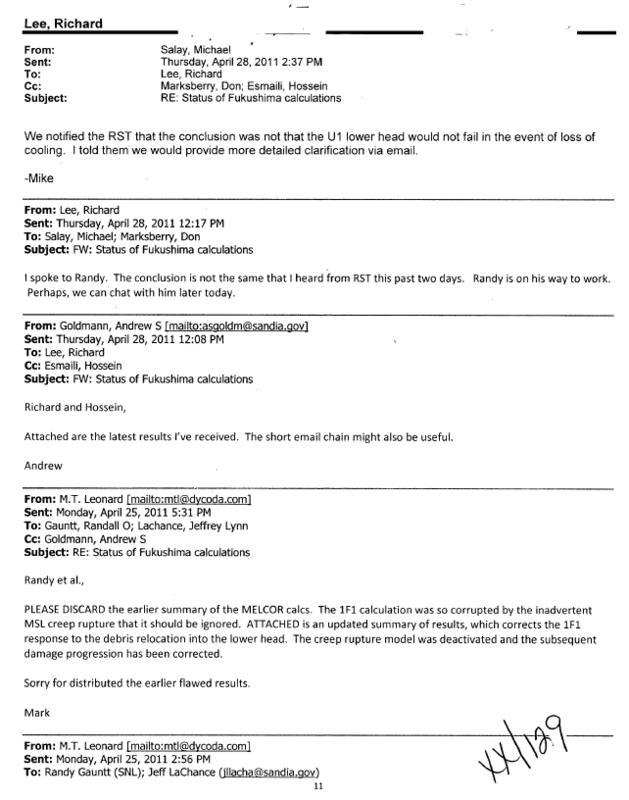 We notified the RST that the conclusion was not that the U1 lower head would not fail in the event of loss of cooling. I told them we would provide more detailed clarification via email.